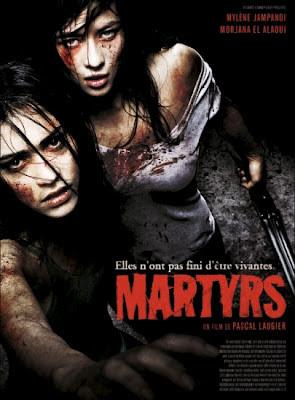 “Martyrs” is the final film in my reviews of the new French horror wave. All four of these films were extremely thoughtful and well made. Nothing exemplifies this more than “Martyrs”. This film could be accurately described as art house existential horror. Written and directed by Pascual Laugier, his film goes the distance when it comes to creativity and graphic brutality. Dealing mostly with the psychological effects of torture and what lies beyond human suffering. The film opens with a disheveled young girl running from a warehouse. This is Lucie she has endured quite a lot while being held captive by a group of unknown people. She is sent to an orphanage and obviously has some severe psychological and physical trauma. She eventually becomes friends with Anna, a girl her age. The film flash-forwards 15 years to your basic family of four having breakfast and conversation when there is a knock at the door. The father goes to answer it and finds and hooded stranger with a shotgun. This person coldly and brutally massacres the whole family. The stranger is Lucie, she feels that the parents of this family were responsible for the torture she endured as a child. She calls Anna who comes right over to deal with the mess. Anna has always taken care of and felt sorry for what happened to Lucie and little by little has gotten in over her head in helping her. Lucie has been fighting her inner demons for years and this gets kind of confusing as Laugier actually creates a woman like a creature that continues to attack her. Upon first viewing, it’s hard to tell what the hell to make of her. Despite Anna’s efforts, Lucie commits suicide. Anna further investigates the house and finds a hidden passageway to an underground facility that is the headquarters to a secret society whose mission it is to contact the other side, to find out what lies beyond death. Certain people, mainly young women are chosen to be martyrs. These people are systematically tortured and psychologically broken until they reach a certain point where they transcend the pain and suffering to enter into a new consciousness. Anna is captured whiles snooping around the place and is subjected to the same torture that Lucie endured. After Anna has been broken it is time for the next stage. Are you ready for this? She is taken into another room and skinned alive, except for her face. She doesn’t scream or seem to feel any pain, she has transcended. She survives this procedure and whispers into the ear of the older women who seems to head this society. The Madam calls a meeting to share the news of what she has heard. If you want to know the rest watch the movie, sucka! This film definitely “transcends” your basic horror movie and goes places we have rarely been. This secret society is composed of rich elderly white people. I guess they want to know what to expect. Sadly, there is an American remake in the works and no matter what they do; it could never come close to matching the stunning effect of this film.